Santosh Nirmal Horo of Kharsidag village in Ranchi hated the way his father climbed tall palash, ber and kusum trees to grow lac. Lac is a scarlet resin secreted by an insect that makes its home on trees. Horo followed his father’s footsteps but not for long. Frustrated with the process of cultivation, he started working for an NGO. But since last year he is back to growing lac in his backyard. “I do not have to climb tall trees anymore,” he says. Thanks to the groundbreaking research by the Indian Institute of Natural Resins and Gums (IINRG) in Ranchi, Jharkhand, many tribal farmers like Horo have returned to lac. The scientists have found a way to produce lac on smaller plants. “We were worried about the back-breaking labour required for cultivation. Production was also dipping because host trees took nearly 15 years to grow,” says K K Sharma, head of lac production division at IINRG. In 2010-2011, lac production in Jharkhand, one of the major producers, dwindled by 42 per cent compared to last year. Lac is used in ammunition, airplanes, furniture polish and perfumes, and in making bangles, imitation fruits and flowers. The scientists’ motive was to give lac farmers a host plant that grows faster and reduces tree-based farming. Ninety per cent of lac is produced on palash, ber and kusum trees. “We started experimenting on the semialata plant and laboratory tests gave positive results,” says Sharma. A native plant of Jharkhand, semialata grows up to one-and-a-half metres in six months. 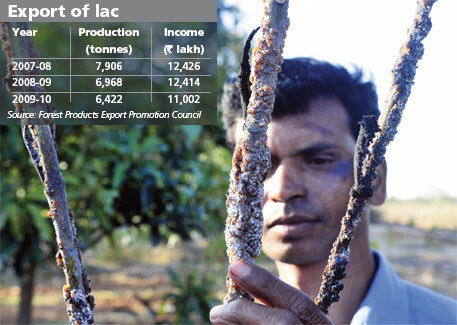 Farmers tie a host shoot of lac insects around the main stem of semialata plant. The lac insects start breeding on their own and require little attention. IINRG scientists have added a few modern farming techniques that ensure better production on semialata plants (see ‘Using semialata for lac production’). In the traditional method, farmers use half of the palash, ber or kusum tree as host. “Using the entire tree would weaken it,” says Sharma. 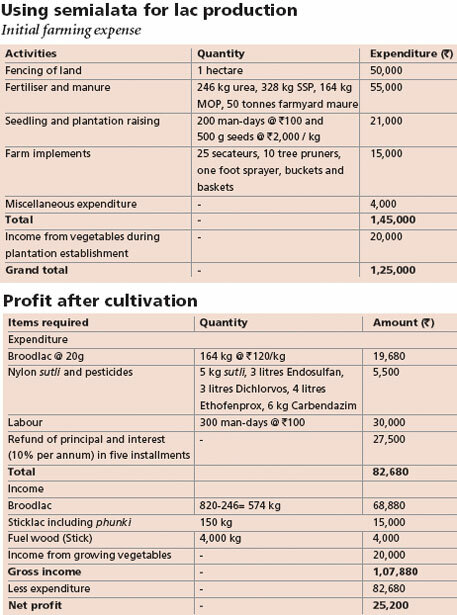 As per estimates by IINRG, a farmer using semialata plant can earn a profit of Rs 25,000 per hectare in the first year, which increases to Rs 1,87,000 from second year (see ‘Profit after cultivation’). Using the traditional method, farmers earned a profit of Rs 15,000 to Rs 20,000 per hectare. In February 2012, Horo cultivated semialata plant on his 0.3 ha. A year later, his land produced 100 kg of Kusumi Lac, a variety that fetches the highest price in the market (Rs 800 per kg). Horo earned a profit of Rs 60,000. To further boost lac production in Jharkhand, IINRG has collaborated with Indian Council of Agricultural Research, Ranchi. It is experimenting with planting semialata plant between mango trees. 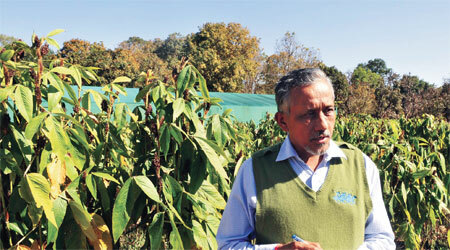 Semialata plant root goes barely 0.3 metre deep into the soil, says Sharma. “Plantation of semialata plants between the spacing of mango trees will have negligible impact on growth of the trees,” he adds. The scientists will hold training sessions for mango farmers for lac cultivation from next year. “We will leave no stone unturned to increase lac production,” say Ramani and Sharma. What should be the minimum gap between two host plants?